Beneath the city that never sleeps is a transit system that also keeps working 24 hours a day. 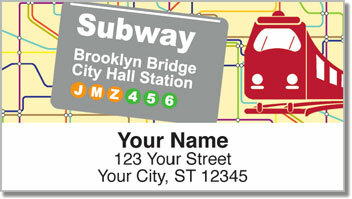 The New York City subway is modern marvel of transportation that helps to keep the Big Apple running. 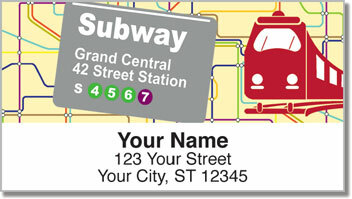 These unique return address labels feature maps and familiar stops from around New York. That includes Yankee Stadium, Grand Central Station and Times Square. Whether you were born and bred in New York, or just fell in love with the city on a visit. These labels make an excellent finishing touch for your outgoing mail. Plus, the often tiresome task of filling out envelopes will become extra easy. That's because these labels are self-adhesive, allowing you to simply stick them on anything you put in the mailbox. 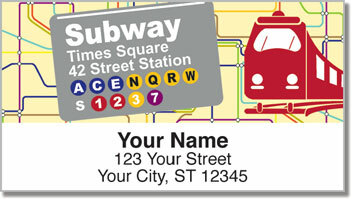 Get your own New York Subway Address Labels today! Complete the order with matching checks.